Yes, yes, yes, yes and yes. I am usually buried in a book, but I definitely do keep and eye & an ear open for my boys. You got them all I think,Oh wait last time we got to go to the pool there is always one parent that was constantly shouting at her kids for no reason at all and they were both crying at the shallow end of the pool and she was paying them no mind at all,they were not enjoying their day at all.I am normally in the pool with the kids and so is my hubs lol. With a little toddler that can’t yet swim, yet has NO fear, I have to be the hovering mom. It’s more for safety than anything else at this point! I am definitely mom number one. I like knowing that my kids are safe especially since there are never enough lifeguards on duty. We’ve had three drownings at area pools this summer. You missed the mom that uses the park as a babysitter and could care less that her manner-less children were irritating other pool guests. We saw way too many of those moms at the water park over the weekend. This is too funny – and SO true! I would probably be the first one. Ha, love this! I am high alert mom! This is hilarious and spot on! I have seen them all! This is funny and SO SPOT ON! 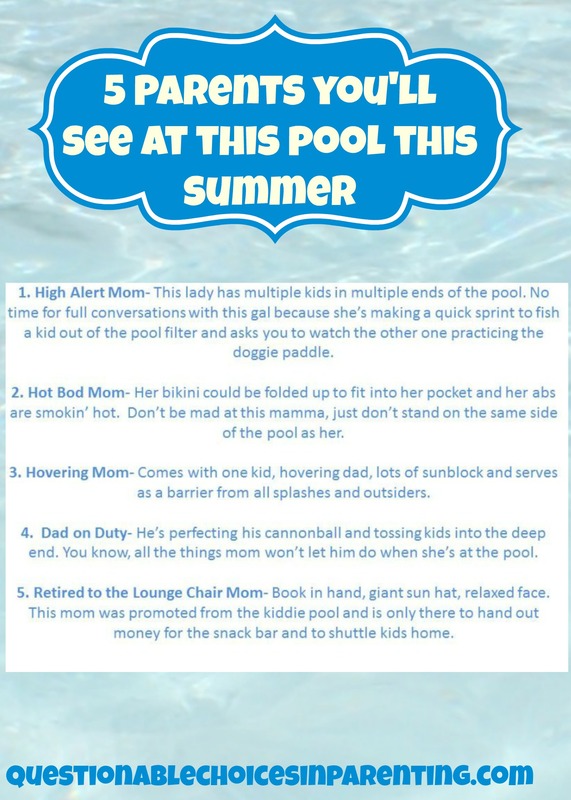 A very accurate list of the moms and dads you find at the pool and even the beach. I am the high alert and the hovering mom! This list is too funny. And very true. I’m definitely the one with the book in hand! I wish I was the last mom. But alas I’m the hovering one. Contantly worrying about my kids in the water. ROFLMAO, depending on the day I have been almost a combination of all of them! I prefer the last mom though. High alert mom and hovering mom are what I am! LOL. I am sooooo careful with my babies when they are around water! Well, anywhere, actually! Well lets see… I am pretty sure I am not the hot bod! Probably the one with book . I’m high alert. I sort of hate myself for it, but my kids need it right now. I’m looking forward to being the sit in the chair mom. Someday. I used to be Mom #1 – High Alert – because while I have 3 children of my own, and they are pretty good about taking care of each other with a huge difference in age; I always take other kids to the pool with us – which means I am everywhere at once. However, since my kids have gotten older and I am really running with 2 now, I am more #5 – chair sitting and chilling. I leave other people’s kids at home more often now that I realize I am the crazy mom who ALWAYS has everyone else’s children – but is rarely without her own! Haha! This is so true. I was the Hovering Mom for too many years! I”m #1, but #5 sounds SO good right now! I am totally the High Alert kind of Mom at the pool. I have three kids and I am constantly on guard and cannot have any conversations that require me to partake in them for too long because my eyes and mind has to be on my three kids in the pool. Constantly. I definitely have retired to the chair mom. Think I have had my suit on once in the pool. Haha this is hilarious! I’m not on the list… I usually have all 6 of my kids at the pool but the older 4 are off on their own so I don’t have to worry. I just sit around in the kid play area with my 2 youngest and chill in the water while they play. Hahaha. Now I wish I could say that I am the hot bod mom but unfortunately I fall into more of the Hovering Mom. This is such a cute post. Also, it is very true. I don’t think I’m any of these, lol! I’m usually the one in the pool with my little one! My Dad was definitely the Dad on Duty one! Cute list! I’ve always been high alert, partly because I want to keep them safe, and partly because I adore watching them. I’m probably guilty of having been #5 when I toted my daughter to the pool or water park 🙂 She’s an only child so I usually brought a friend along for her to swim with so I didn’t have to get wet, lol! yeah the mom in the bikini makes me cringe when I have young boys. I wish people were a bit more modest in their swim apparel. Hilarious. I wish I was the hot bod mom! Instead, we had another little boy tell my husband his belly was fat!!! NOT A GOOD DAY for us! 😉 Of course, there was NO MOM on duty on that one, who was also splashing away. At our house I am the lounge chair mom if I am not in the water! I would like to “retire to the lounge chair”, but I think I shall remain on high alert. That was a fun read. Thanks for sharing! This is hilarious and very true. Good observations! This is too funny! I’m pretty sure I would be the High Alert momma. Thanks for sharing. This list is hilarious! I would be the Mom either on high alert or lounging in the chair w/ my ipad or phone. Hilarious! I would definitely be the High Alert mom. Which is probably why we don’t go to the pool. Haha this is very true. You know what they say, it takes all kinds of kinds. This is SO true! ahah. I see the “hovering” type all the time! Haha, too funny! I’m guilty of being hovering mom for sure. LOL, this is great! I was hovering mom. True, True, True. I’m a toss up between High-Alert Mom and Hovering Mom.